I heard the sad news about Ericksen’s slight gain in his lead over Pinky Vargas today while I was out for a walk listening to yesterday’s Whatcom County Council Public Works and Health Committee meeting. I had wanted to see how the request by the Public Health Advisory Board for support of immigrant families in our community was received by the Council committee members. That committee is chaired by Council Member Barbara Brenner who seemed to be on a mission that day to have plenty of time to continue the discussion of the Point Roberts solid waste management issues that has been ongoing, off and on, for a few months. By 1:19 minutes on the audio of the meeting the three members of the committee, Council Members Brenner, Barry Buchanan, and Tim Ballew had breezed through approving the Glacier Water District Water Comprehensive System Plan, and an ordinance creating a Whatcom County Food System Committee. 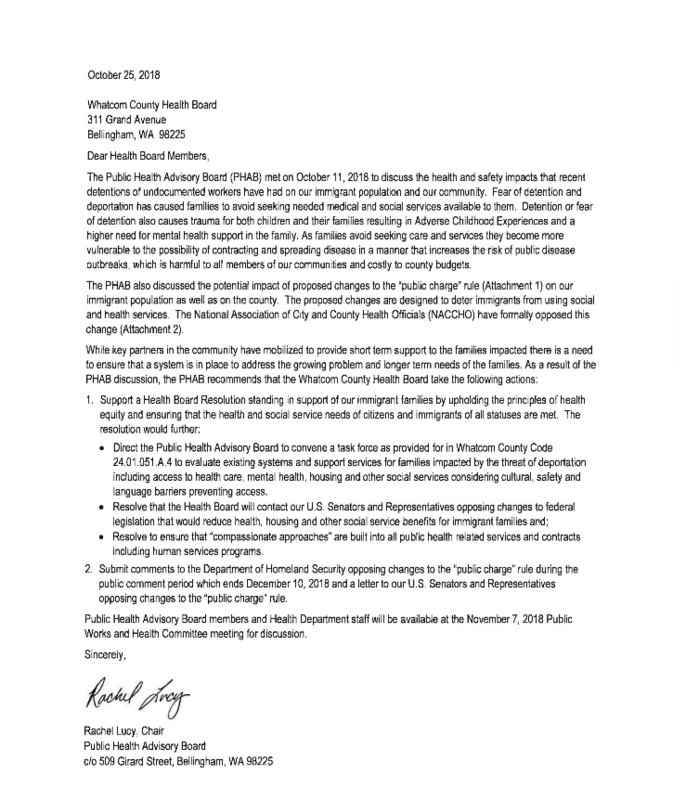 The letter recommended, in part, that the Whatcom County Health Board take actions to develop a resolution to “support our immigrant families by upholding the principles of health equity and ensuring that the health and social service needs of citizens and immigrants of all statuses are met.” A task force was proposed that would “evaluate existing systems and support services for families impacted by the threat of deportation.” Additionally, the Health Board was advised to resolve to contact Senators, Representatives and the Department of Homeland Security to oppose changes to the “public charge” rule. Council Member Brenner: The other thing is this one, and I kind of like it but I’ve got some problems with it. Public Health Advisory Board seeks support to move forward with a proposal for a Resolution to stand in support of immigrant families in Whatcom County. Before you start, I just want to say for the record I’m in complete support of any immigrants who are here legally. And if they’re not here legally, I’m not in support. So, you know, without that word in there, ’cause legally it’s fine. They don’t have to be, like, citizens yet. They don’t have to be anything. But they have to have been in here, you know, come in legally. Period. That’s my only concern about it. If you wanna just add that one word, “legal” immigrants, or “here legally” or whatever. Regina Delahunt: So this is Regina Delahunt. I’m the public health director. So, for today, all we are really asking is for just a approval for the Public Health Advisory Board to move forward, taking a look at drafting a resolution, perhaps putting together a task force, and then come back, of course to the Council, with that resolution that establishes the task force, and has, you know, the specific wording. Council Member Brenner: I want it, I’m not supportive of it just being a broad “any immigrants,” especially if they’re, not only here illegally, but there was problems too, like – whatever. Council Member Byrd: I was going to second that. Council Member Brenner: You can’t second it. You’re not on the committee. Council Member Byrd: Not in the sense of voting, but Ms. Brenner’s opinion. Anyone that’s come in the country legally, I would like to see that we support them as much as we possibly can. But if you’re not here legally, I think that’s disrespectful to the people that have gone through the process and spent the time and money and that they don’t have the same – that’s a different situation. Regina Delahunt: I’ll take that information back to the Public Health Advisory Board. And, so I guess what we’re really asking for is just some direction for them to move forward with crafting a resolution. Council Member Brenner: Okay, well I’m just going to put one word in there, then that says “stands in support of legal immigrant families in Whatcom County,” which we have plenty of, enough to make it worthwhile. Council Member Brenner: We gotta vote on the motion. Regina Delahunt: There’s one other part on the resolution which would be submitting comments on the change to the “public charge” rule and that was in your packet, as well. Council Member Brenner: Yeah, no, I read all that. The only change at all is, I just wanna make sure that it’s people who are legal. Regina Delahunt: I’ll bring that information back. Then it was on to the Point Roberts discussion. Let that sink in. Not one person in the Council chambers took an extra moment to offer support for the intent of the request to support immigrant families of all statuses because these people are our friends, neighbors, and community members, and as the Public Health Advisory Board pointed out, their suffering due to the persecution they endure because they are immigrants – potentially without legal citizenship – threatens the health and well-being, both physically and financially, of our County. Not one word of support was offered by any of the Council Members in the room,* in a county that supposedly, according to some Bellingham City Council Members, contains a city with a sanctuary city ordinance, but without the title. This is an ordinance that has given no sanctuary to 16 people who were apprehended by ICE in Bellingham in the early morning hours of August 29, 2018, some of them Bellingham residents for 20 years or more. There has been no sanctuary for Maru Mora-Villalpando, an immigrants’ rights advocate without documented U.S citizenship, who still, almost a year after deportation proceedings were initiated against her, has no confirmation she can remain here in Washington with her daughter. *This portion of this sentence originally read “any of the seven Council Members in the room,” and it has been pointed out that on the audio for the 11/07/18 committee meeting, Council Member Brenner acknowledged that in addition to the three Council Public Works and Health Committee members who were present, it was just Council Member Byrd was also in attendance at the beginning of the meeting when she made this acknowledgement. The draft minutes for the meeting show that all Council Members were in attendance of the meeting at some point. It is not known when they became present. This entry was posted in Blog Post, Commentary, Information and tagged Barbara Brenner, Barry Buchanan, Human Rights, ICE, Immigration, Immigration and Customs Enforcement, Public Charge Rule, Public Health Advisory Board, Public Works and Health Committee, Rachel Lucy, Regina Delahunt, Social justice, Tim Ballew II, Whatcom County, Whatcom County Council, Whatcom County Health Board. Bookmark the permalink.